ALWAYS A CLEAN TITLE AT FORREST MOTORS - 4x4 - TRD OFF ROAD - 1-OWNER CLEAN TITLE PERFECT CARFAX - YOU FOUND IT... THIS IS IT!! 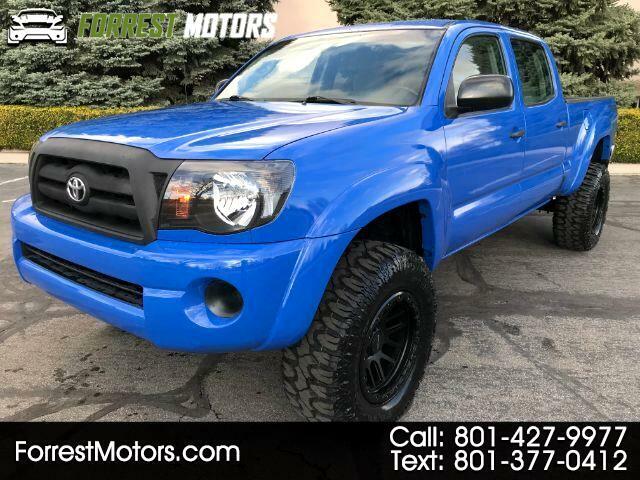 Crazy low miles and amazing condition Tacoma with Long Bed and Crew Cab. CUSTOM PAINT,LIFT and LEVEL KIT, NEW Off Road blackout rims with new 33 inch M/T TIRES (you know this lift, wheel, and tire package are exactly what you wanted to do to your Tacoma anyway!). Custom blackout TRD headlights and grill. Interior is in amazing shape and the exterior is perfect!! This has great options including: power windows, locks, mirrors, cruise, alarm, keyless entry, tow hitch, tint, and much more. Enough of the sales talk, you just need to get in here and take this for a drive. As low as $350 monthly payment with $0 down on this truck O.A.C. With almost 18 years in the business in Utah County, come see why we were named Orems BEST USED AUTO DEALER. Stop by anytime during our normal business hours 10-7 Monday through Saturday or visit us online at www.forrestmotors.com and view the CARFAX vehicle history report or fill out a finance application to gain access to the lowest interest rates in town (OAC) through one of our preferred lenders or the bank or credit union of your choice. Come see why so many people are already driving a quality used car from Forrest Motors and referring their friends and family to us. We hope to serve you soon.